Mini Naturals - Peanut Butter Flavor, 6 oz. 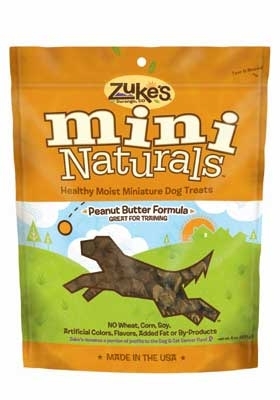 Pouches - Mini Naturals are ideal for training or anytime as a delicious reward. The healthy benefits of rice, malted barley, and essential vitamins & minerals will keep your dog begging for more. Mini's are tender, meaty, free of preservatives and contain no wheat, corn, added animal fat, artificial colors or flavors. Small finger-nail size pieces are perfect for training. Mini Naturals are also the perfect treat for smaller dogs. Mini Naturals - healthy, moist training treats.